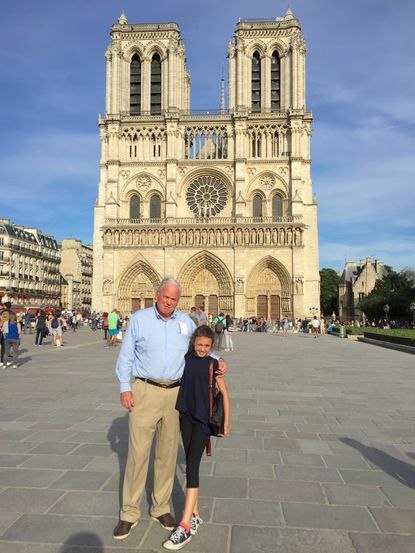 Craig Stapleton with his granddaughter, Loulie Reyes, outside Notre Dame Cathedral in Paris. Connecticut’s Craig Stapleton, the former U.S. ambassador to France, said he expects that Americans will rally to help Paris recover from the devastating fire at its world famous Notre Dame Cathedral. The Greenwich resident expressed disbelief and sorrow over Monday’s massive blaze, which destroyed the 900-year-old church’s spire, roof and iconic stained glass windows during Holy Week. Stapleton was the envoy to France for President George W. Bush, to whom he is related through his marriage to Bush’s second cousin, Debbie Walker Stapleton. Stapleton said you don’t have to be a Catholic to understand how sacred Notre Dame is to the French and visitors from all over the world. Stapleton said he often reminds people about the time-tested bond between the U.S. and France. He said he often asks others if they know how many troops the U.S. sent to France during World War I, which ended in 1918. “We sent 2 million Americans to France in World War I,” said Stapleton, adding that those sacrifices are often overshadowed by D-Day landings at Normandy during World War II. Debbie Walker Stapleton with her granddaughter, Loulie Reyes. Debbie Walker Stapleton said it’s a shock, considering that Notre Dame withstood the Crusades, the Napoleonic Wars and two World Wars. She said scores of people have contacted her by email to say how upset they are and to offer help. “I am confident the goodness in Americans will help rebuild this magnificent cathedral,” she said.